If you’re looking for roof lights, you need look no further than Direct Rooflights. Our professional rooflights fulfil a wide array of purposes, from providing ventilation for smoke to providing extra security for your premises. All of our rooflights are made to the highest quality using only the best materials available to us, ensuring that we supply only the best and highest quality rooflights available for money. We have two ranges available: Our Premier range and the Trade range. Our Premier range guarantees complete protection against the weather and light transmission, guarding effectively against UV rays thanks to the UV protected polycarbonate. It also offers great insulation for heat and against noise as well. Available as double or triple skin domes or pyramids, with glazing tint options available, you can be assured that we can offer you the best rooflights. We have a smoke vented unit available that is fitted with 24v electro-magnets for manual opening and closing or even electric opening and closing, or can be fitted to a smoke ventilation system for further protection when working with smoke and fumes. Our Premier glass unit offers a sleek look, with double glazed low-e safety glass and internal water management systems. They come ready assembled in various sizes for an easy installation. Our trade range offers similar rooflights, crafted from top quality PVC to ensure that they last longer and even withstand inclement weather. They are extremely cost-effective and particularly suitable for businesses looking to add extra natural lighting and protection to their premises for a low cost. We manufacture and provide DuraGlaze glass rooflights. The flush glazing system offers a great degree of security and insulation and they are custom-made for our customers, ensuring that they match your requirements perfectly. The aluminium frame can be painted in any RAL colour of your choice so that they do not affect the aesthetic of your property. 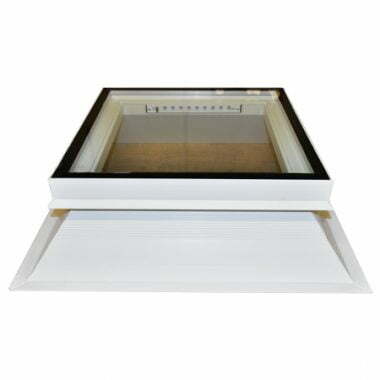 Our range of roof lights is available in standard sizes from 600 x 600mm to 1800 x 1800mm. With double skin, triple skin and quadruple skin options, at low prices they provide great value for money. 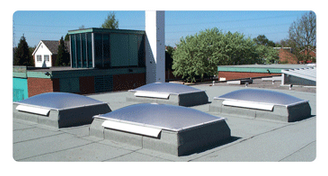 We also manufacture polycarbonate dome and pyramid rooflights. We offer 48 hour delivery, ensuring a quick turnaround and delivery straight to your premises in a matter of days. We can craft custom rooflights exactly for your premises too, ensuring that you get a high quality, tailored service and rooflight. To find out more about our roof lights, call us today on 01670 821166 or e-mail us at info@directrooflights.co.uk.